Speaking of bikes, I biked down to the Baha’i Centre yesterday in order to make some calls—home internet got cut off for some reason, and my newfangled Vietnamese cell phone is on the blink (bad battery, I think). Once there, I cooled down for a few minutes and then made plans to meet Tahirih, my contact for the National Spiritual Assembly’s website, in about an hour to discuss things. Where? Well, why not District 1—downtown? Sure. Except that it appears that the trip from the Baha’i Centre to District 1 is about half an hour long on a motorbike (hence, even longer on a bicycle). Oops. After a little while’s worth of thinking, I ended up asking for a motorbike ride from Chi, one of the Baha’is at the centre, and managed to get there in time anyway. We met at a nice little French bistro—yup, French influence in Vietnam is still strong. Tahirih brought along her kids, who ordered pizza and ice cream and played with Chi while we talked web design and determined what had to be done in the next week or so, before I leave HCMC for Danang next week. After the meeting was done, we motorbiked back through considerably thicker traffic to reach the Baha’i Centre once again, and after taking a few more minutes to cool down, I biked back home on my little one-gear clinker, doing my paperboy schtick through a throng of motorbikes, cars, buses, carts, horses(!! ), and just random confused people. I think I love this place… but it’s a strange kind of love. 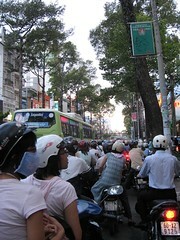 This entry was posted in asia chronicles, journal and tagged travel, vietnam by danger. Bookmark the permalink. OMG you would be the one to talk!!!! I really liked this post. Your description of traffic made your experience so much more accessible to the rest of us…who are here. Right here beside me. experience living in vietnam, that is.